It does not matter if you are building your own yoga related website or you are hired to build one the next yoga WordPress themes collection will help you tremendously. These themes come with features that will do most of the work for you without having to code anything. Additionally, most of them also include pre-designed homepage demos that you can set up in minutes leaving it up to you to add the content. Yoga WordPress themes are the best way to go if you want to develop yoga related websites because they are SEO optimized for better rankings, translation friendly, well coded and protected against hackers, and mobile responsive. Creating a fully functional and user friendly website can be a challenge this is why we recommend the next few themes. If you are looking for an easy to use and feature rich yoga WordPress theme, then Asana should be your first choice. Asana will help you get more clients for your business and make your yoga classes more known. To make it easier for your visitors, this theme allows you to build stunning classes’ schedules, a shop page, event pages, responsive sliders, and wish lists. Having all your information on the front page will help you visitors reach a decision and maybe persuade them to check out your class. Additionally, Asana includes the demo content, translation support, SEO optimization, PSD files, and a complete documentation. Pick Asana up! Yoga X gives you plenty flexibility and customizations when it comes to layout and functionality. This theme can be used for personal coaches, wellness, spa, gym, and meditation websites. The design of Yoga X was crafted to perfectly fit yoga websites and comes with lots of incredible features. To get to the point, Yoga X includes class timetable, color options, typography, Visual Composer, slider Revolution, trainers’ classes, WPML integration, integrated mega menu, Google maps, and structural options. Thanks to their support team and documentation you surely will not get tangled in all its features and options. 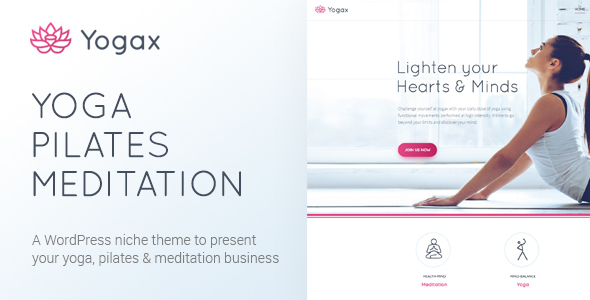 Set up your yoga website in minutes with Yoga X! Lemon is one of the most versatile yoga WordPress themes that you can find. While installing and setting up Lemon, you will instantly notice how easy it is to use it and how charming its design. With Lemon you get original homepage demos that can be adapted to a variety of niches and they all are 100% responsive and cross-browser compatible. Apart from them, you also get full WooCommerce support, free powerful plugins, unlimited color options, over 500 Google fonts, language .pot files, and WPML compatibility. If you want a faster set up you can import the demo content with one click and mirror the demo website. No matter what you have in mind, Lemon will make it easy and enjoyable for you. Yoga Fit is stunning, one of a kind, flexible, and responsive yoga WordPress theme that will give you the possibility of developing an original and professional website to promote your yoga classes. Thanks to its timetables and classes features, Yoga Fit makes it easier to notify your audience of your classes and how long each takes. Keeping your content and information accessible and straightforward is a great way of gaining new clients. Apart from the obvious benefits of purchasing a premium yoga WordPress theme, with Yoga Fit you also get free lifetime tech support. How awesome is that? This theme is also fully integrated with WooCommerce simplifying the process of selling products and goods. Try it! Kriya Yoga is full of creative possibilities and jam-packed with options and tools. It was specifically designed to serve as a platform for yoga websites and you can tell from its peaceful and simple design. 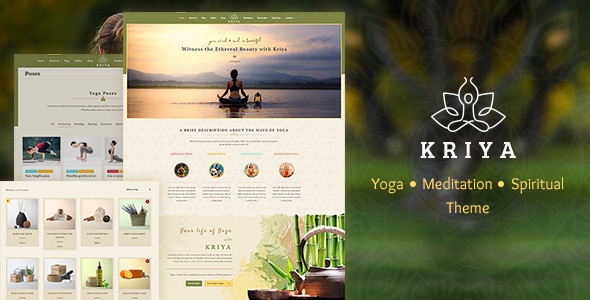 Kriya Yoga has a selection of features among which are mega menu integration, blog page layouts, portfolio styles, courses system, poses module, poses detail page, drag and drop Visual Composer, shop layout, upcoming events and workshop layout, animated sliders, and gorgeous pages. Any type of yoga related website you want to start, Kriya Yoga is the right theme for you. Everything you are looking for and want in yoga WordPress themes, Fitness has. It comes with several uniquely designed homepage demos that will allow you to create a website in minutes. If you are not satisfied with their look you can easily tweak them until they meet your demands. 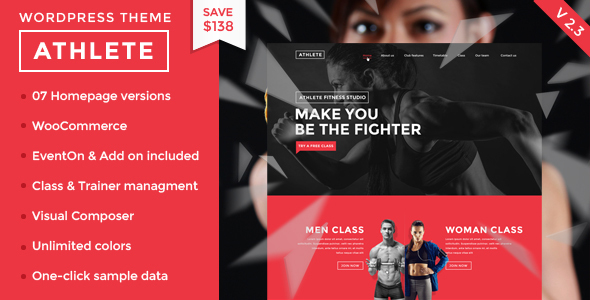 With Fitness you also get your hands on classes, blog, and shop templates, galleries, Visual Composer, Slider Revolution, color variations, shortcodes, sample data, child theme, RTL support, and more. Fitness will assist you in developing a yoga website specifically for your target audience. Fitness offers only the best! Hershel is a stylish, versatile, responsive, intuitive, and classy multipurpose WordPress theme designed to fit any niche and field. Hershel comes bundled with no more than 15 website demos you can use as a start for your business. In addition to these demos, Hershel also comes with replaceable blocks, header variations, flexible portfolio, page builder, addons, stunning slider, video backgrounds, smooth parallax effect, custom icons, and free support. Having multiple design elements on the front-page gives you the chance to showcase your most important information about your classes, trainers, schedule, and so on. With this theme you can promote your business online effortlessly. 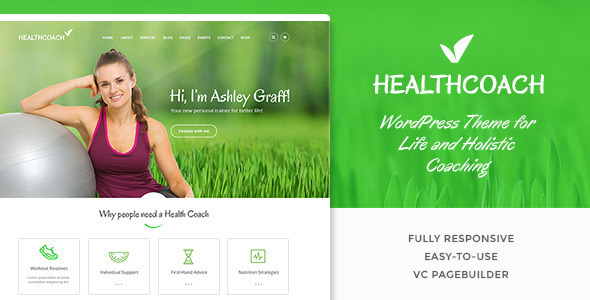 If you are or want to promote a yoga coach then Health Coach is the perfect yoga WordPress theme for you by far. Installing and setting up this theme is a piece of cake because it comes with all the necessary tools. Health Coach is bundled with Slider Revolution and Visual Composer meaning that you save over $50. With this theme you will have no trouble customizing every single element and personalize it to match your vision. All the options and features can be found in the theme admin panel and if you are having a hard time finding something, you also benefit from free tech support. Make the most out of your yoga website with Health Coach! Athlete Fitness is a very flexible, smart, capable, unique, and user-friendly yoga WordPress theme. Athlete Fitness has all the features a yoga website needs: schedule, class information, trainers’ management, events manager, potent page builder, WooCommerce integration, beautiful homepage layouts, full width slider, multiple headers and footers, live customizer, unlimited fonts and colors, and demo content. As far as fitness related themes go, this one is a great choice and you should take advantage of it asap! 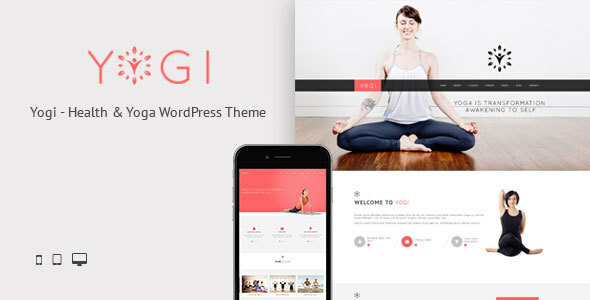 Yogi is a premium yoga WordPress theme can is highly customizable, versatile, and can be adapted to a wide variety of fitness related websites. This theme comes with Noo timetable plugin included which helps you manage classes and events using an intuitive user interface and brilliant design. You can choose one of the two available demo homepage templates or create your own design using Visual Composer drag and drop page builder, widgets, custom menus, shortcodes, fonts, and colors. With Yogi you will manage your yoga website more effectively and save valuable time. If you are looking to promote your yoga classes online without breaking a sweat you should check out Yolia. This theme has a feminine, classy, chic, and modern design that will help you create a great first impression while also allowing them to see what you are all about. Yolia can suit any vision because it natively comes with 3 header styles, 3 homepages, and 3 sliders. Combining these already gives you several unique layouts options to get started. Yolia also has a clean and SEO optimized code, full responsive design, multilingual capabilities, and mega menu support. Yolia can make your dream come true! 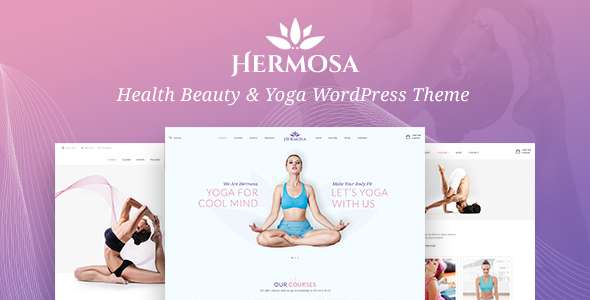 Hermosa is a great tool for webmasters looking for powerful yoga WordPress themes. Hermosa’s design has the ability to improve and take to a higher level any website especially a yoga related one. Hermosa has been developed to take little time to set up and install. The demo content is readily available and with only one click you can have an exact copy of the demo. If you want to dive into specifics, Hermosa also comes with class schedule, 5 custom post types, custom widgets and sidebars, live customizer, Visual Composer, 2 home demos, pricing table, Slider Revolution, and WooCommerce integration. Give your website a makeover with Hermosa! 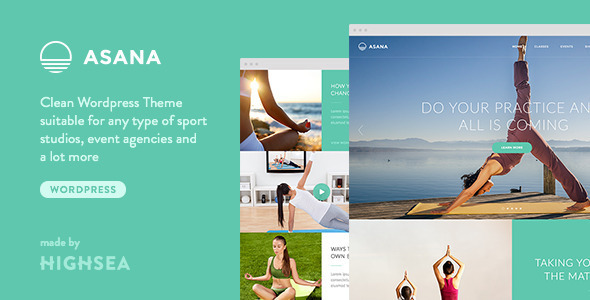 Sports & Life is an incredible, dazzling, alluring, ad ambitious yoga WordPress theme. This theme balances perfectly a beautiful design with a powerful functionality which made it deserve its place of this list. 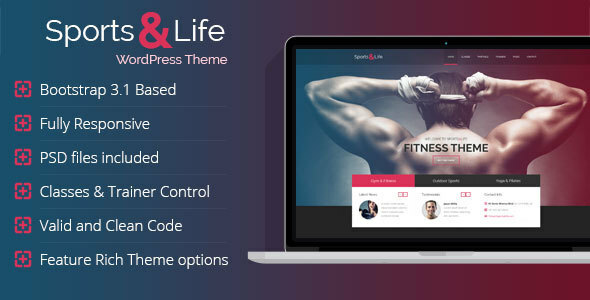 Sports & Life offers a great documentation, responsive features and design, Google font integration, child theme, translation files, Twitter widget, contact and subscription forms, trainers’ page template, homepage template, and classes’ template. Promote your business with Sports & Life! Spa Lab has a clean, effective, peaceful, fearless, gorgeous design that fits perfectly for yoga and spa related websites. The most effective way to gain new clients is to provide all the information they need upfront so they can make up their mind and with Spa Lab that comes easily. 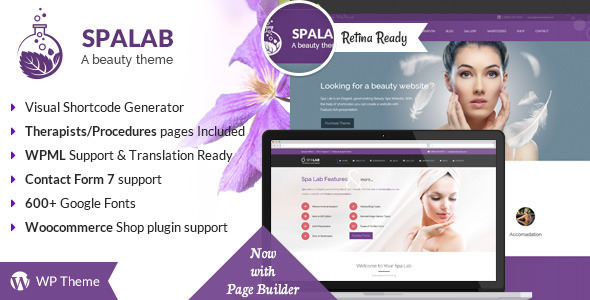 Spa Lab comes with a coming soon page which is pretty handy and you can use it while developing your website. Additionally, it contains a 404 page template, inner page templates, beautiful shortcodes, appointment form, gallery layouts, hover effects, an integrated page builder, and free support. Check out its live preview for more details. 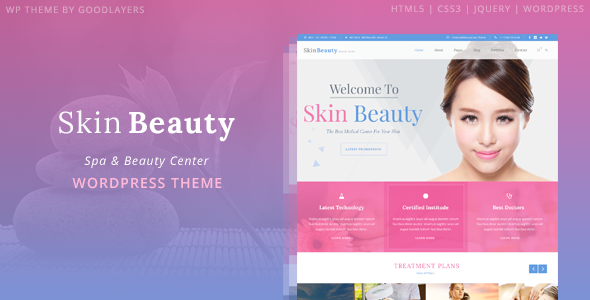 Coming in last place for the best yoga WordPress theme is Skin Beauty. This theme was mostly designed for beauty salons but thanks to its flexible design and functionality it can be adapted to several other niches. Skin Beauty has an impressive number of features some of which are custom product layout, shop page and integration with WooCommerce, several post formats supported, integrated with Master Slider and GoodLayers plugin, 7 portfolio styles, and WPML support. Increase your client number with Skin Beauty! Do you agree with our list for the best yoga WordPress themes? Let us know in the comments below if you have any suggestions or which theme proved to be the best one for you.